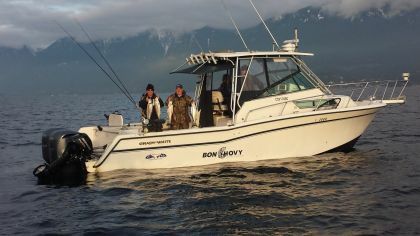 Bon Chovy Fishing Charters operates some of the best salmon charter boats in Vancouver. 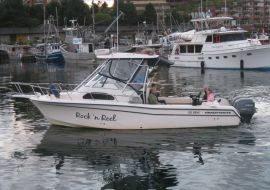 We operate 5 Grady White sport fishers in the 23 to 30 foot range. 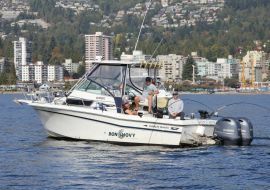 We have the most comprehensive fishing fleet and guiding team in Vancouver and are able to accommodate single anglers to large corporate groups of 50 or more. Nothing compares to the ride and layout of a Grady White and the reliability and performance of our new Yamaha and Mercury 4 stroke outboards. 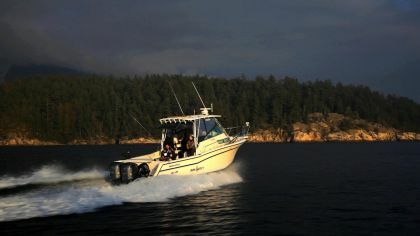 Our boats are some of the fastest charter boats in town giving us the capability to run where we have to in order put our clients into fish consistently. We are proud "Pro Staff" for Gibbs Delta Tackle and exclusively run their best in the business fishing tackle on our charter boats. We also run Scotty Downriggers, Islander Precision Reels, and Shimano Rods to complete our first class charter boats.